El Paso is a unique American city. Self-sufficient and surprisingly large, the city has a modern downtown, with a commercial district and low skyscrapers, and development spreading mostly to the north and east. Because of its isolation, large industry has never taken root, but the area does have some agriculture, ranching, mining, oil, and “maquiladora” industry powered by low-cost labor from Mexico. Fort Bliss brings a military presence to the economic and social base, and the recent base realignments have helped by locating more facilities and personnel there. There is an assortment of small museums mostly commemorating the history of the area, and the University of Texas at El Paso adds 16,000 students, a nice campus, and some sports amenities. Nearby geologic areas and the Franklin Mountains State Park offer some outdoor recreational opportunities. The climate, low cost of living, and the “get-away-from-it-all” isolation have made it a popular retirement location. The area is hundreds of miles from a city of any size, but the independent spirit and the availability of low-cost airline flights makes the area less isolated than geography may imply. The city is located in a flat valley among dry hills. The Rio Grande flows along the southwest border of the city. The Franklin Mountains begin within the city limits and extend northward with peaks up to 7,200 feet. 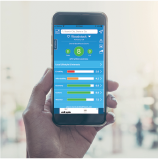 The climate is characterized by an abundance of sunshine throughout the year, high daytime summer temperatures, very low humidity, scant rainfall, and a relatively mild winter season. Daytime summer temperatures are frequently above 90 degrees, and occasionally above 100 degrees, but nights are usually comfortable. Winter daytime temperatures are mild with freezing night temperatures common during mid-winter. Rainfall throughout the year is light and insufficient for any growth except desert vegetation. Dry periods lasting several months are not unusual. Most precipitation occurs July through September from brief but often heavy thunderstorms. Small amounts of snow fall nearly every winter but seldom remain on the ground for more than a few hours. Spring dust storms and sandstorms can occur. The median home price in Sierra Blanca is $56,000. Browse Homes in this Range. 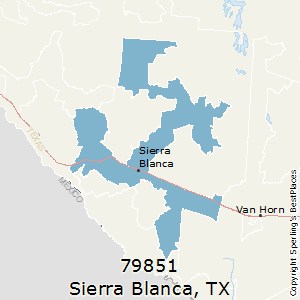 Compare Sierra Blanca (zip 79851), Texas to any other place in the USA.